Mairead Case is a working writer and teacher. 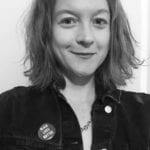 Currently a PhD Candidate at the University of Denver, she teaches poetry and narrative at DU, the Kerouac School of Disembodied Poetics and the Denver women’s jail. Mairead is the author of the novel See You In the Morning (featherproof), the poetry chapbook TENDERNESS and (with David Lasky) the forthcoming Georgetown Steam Plant Graphic Novel. She has been a legal observer with the National Lawyers Guild for a decade.